With the Gold Line Foothill Extension project nearly 50 percent complete, it’s a good time to start pondering some of the development that will take place along the 11.5-mile route between eastern Pasadena and the Azusa/Glendora border. Thus, the above report from the city of Monrovia on planning efforts for the “Station Square” area around the future Gold Line station there. 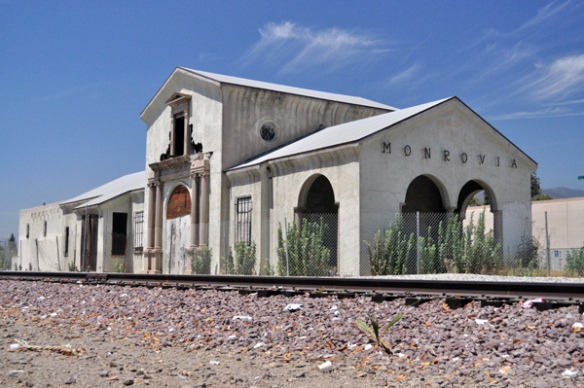 The Gold Line platform, in fact, will be just a few feet west of the old Santa Fe depot that served Monrovia for many decades, although the building is now in need of some serious rehab work. The Monrovia station is interesting, I think, because it’s a challenging site. The Gold Line is being built along the old Santa Fe alignment through the northern San Gabriel Valley. While the tracks pass through downtown Arcadia and Azusa, in Monrovia it’s a different story: the city’s very well-tended downtown is north of the 210 freeway while the Gold Line tracks and station are about a mile away on the south side of the 210. As a result, Monrovia officials are trying to upgrade the land adjacent to the station — there are some vacant lots — and better connect the area to the rest of town through improved sidewalks and bike lanes. It makes sense. There’s another challenge here. If you’ve been following this project over the years, Monrovia had planned for there to be a massive transit-oriented development built around the station. Those plans unfortunately fell through and it remains to be seen what kind of future plans emerge for the area. I hope they can build something as ambitious as the earlier plan. I’m also very intrigued to see what happens with the old Monrovia station and others in the area. Downtown Azusa also has an old Santa Fe depot that is shuttered and, as we wrote recently, work on rehabbing the old depot in North Hollywood is underway. The old streetcar at the Veterans Administration campus in West L.A., built in 1900, is extreme disrepair. But no one knows yet what any of these stations in Monrovia, Azusa or NoHo will actually become. It seems to me that all three are suitable candidates to be repurposed into something nice. 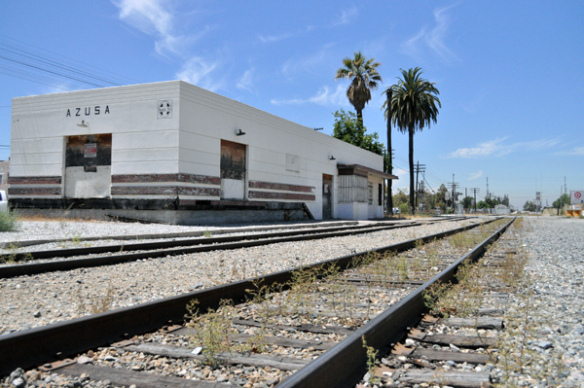 The old Pasadena depot, steps from the Gold Line at the Del Mar station, could be a template. It hosts two restaurants — La Grande Orange and the Luggage Room — that are thriving. Do you have a link to your story about the old depot in NoHo being restore? hopefully one of those restored depot’s can become a rail meuseum. The Luggage Room is a great place! I highly recommend it! I think the project will help anyone commuting between foothill cities and Pasadena and L.A. Anything to avoid the 210! While they seem to have added some bike lanes, it doesn’t look like they are giving much (or any) thought about emphasizing bike travel for that “last mile” (like the bike stations in Long Beach and Santa Monica). There don’t even seem to be any bike lanes/paths connecting directly to the station.